There are certain qualities in a father that mean the most to me. First, I think a father should provide unconditional love. A father should encourage their child to be a critical and independent thinker. A father should inspire their child to be a dreamer and follow those dreams, no matter where in the world those dreams will take them. A father should teach their children how to respect others, as well as respect themselves. A father should be fun and patient and always embrace the silliness in his children. A father should demonstrate how important it is to follow the rules and be responsible for one’s actions. However, he should also teach his children to think for themselves and use good judgment, even if it means breaking a rule every now and then. Finally, a father should teach his children the importance of giving back and respecting other people, no matter their background or differences. There are so many qualities that make a good father, and everyone would have a different list. These are the qualities that have had the most impact on me and I am blessed that my dad embodies all of them. I have been blessed with great men in my life – my father, my two older brothers, my husband, my father-in-law, my uncles, my brother-in-laws, and of course my grandfathers. I wish them all a very Happy Father’s Day! There is no denying who is my father. I look just like him. He loves the story of my co-worker that once said, “wow, you look just like your dad. It’s creeping me out.” It is a striking resemblance, but in the end, I hope that it is some of my other qualities that have the strongest connection to him – my competiveness, ambition, generosity, humor, tender heart, instinct, courage, and stubbornness not to give up. 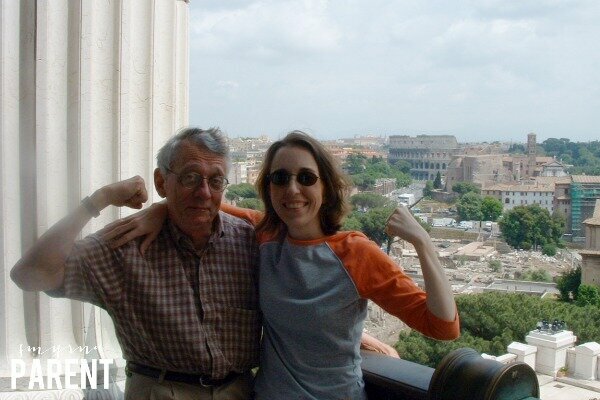 My dad and I have both been affected by Crohn’s Disease in our lives, and if it weren’t for him, if it weren’t for these qualities, I would never be here today. My mom always told me that my dad was surprised when I came along because he had never thought about having a girl. He had faith in me from the beginning and knew that I could do anything I wanted to do in this world. I grew up in Titusville, Florida with a pool in my backyard. 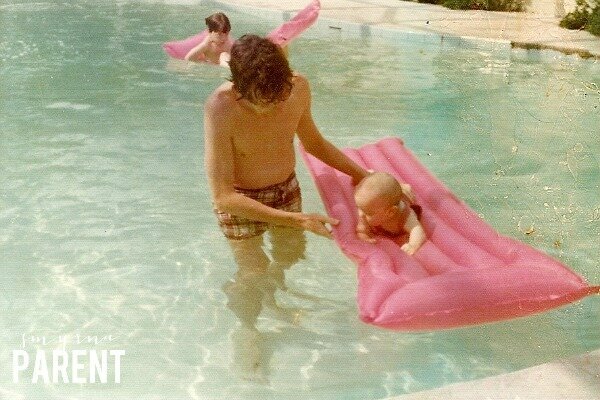 My dad had me in the water (no flotation device) at 8 months old. Before long, he was pushing me to the bottom of the pool to pick up pennies. We were buddies from the beginning. We had at least 10 games we would play in the pool that he made up. He would come home from work and put me in his Scout Jeep and take me down to the convenience store or ice cream shop for a treat. After he and my mom saw the matinee stage production of “The Wiz” in Orlando, he came home, put me in the car, and we drove all the way back for the evening show. He took me to his office on the weekends and I would pretend to be his secretary downstairs. He taught me how to keep score at major league baseball games. He taught me how to write. He inspired me to want to see the world. He shared his love of Broadway and took me to New York City on a regular basis (we hope to go again soon). He shared his love of reading and history and has inspired me to want to learn more. Although I fought it for so many years, he actually does have a good taste in music, which I am sure has had an influence on my love for country, bluegrass, and jazz. The funny thing is, I continue to learn from him with every year and am most grateful for what he gives my daughter as her “Gran.” He is in love with being a grandfather and seeing his four nieces and one grandson every chance he can get. He loves his family with all his heart and has always made me feel like my brothers and I were his first priority. He travelled a lot when we were growing up and still works and travels at the age of 74 years old. But I never felt his absence because he was always so present when he was home. My dad is not perfect. No one I know is perfect, most certainly not me. But I think my dad would be one of the first to admit that and has always been pretty hard on himself. I know I get my stubbornness from him. He has already arranged to have a copy of his car keys given to a friend, so when we take his keys away one day, he can still get away in his car and head out west. My dad and I have a very special relationship and friendship. It has grown and changed over the years, but I still look to him for guidance and wisdom. We truly enjoy each other’s company. One of the things I am most excited about is that the qualities I treasure most in my dad, I also see in my husband. I find great comfort in knowing that Megan will grow up and go through life with a dad that embodies all the qualities a dad should process. One of the greatest things that both my dad and Bob share is their love of being a dad. Bob will always be there for Megan in all the ways she will need him. He provides her unconditional love and support and encourages her to try her best and be respectful of others. He is the stable force in her life and I have fallen in love with watching their relationship develop in her first three years of life. Between their yogurt dates and Dr. Seuss adventures and their Saturday mornings when I am running and their pool time, Bob never misses an opportunity to have his special time with his girl. He is always there, which is really what it is all about. So, when does a father become a “dad” or “daddy?” I am sure there are as many opinions about this as there are answers, but I think it is about the bond between a dad and his child and the connection between two hearts. 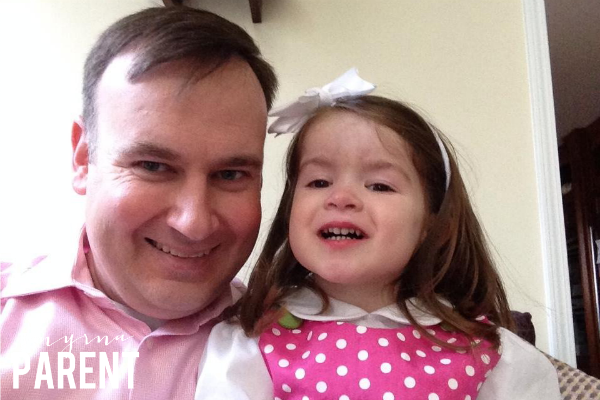 A dad longs to be with his kids and be there for his kids. He feels responsible for them and ensuring their safety and well-being. He embodies the qualities or similar ones that I mentioned above. Bob and I are very much a team and share the responsibility in raising a strong and confident daughter. My parents did the same. I am very aware of how blessed I am to have these relationships and sources of support. The relationship with my dad goes to the core of who I am and I could not be more grateful that God sent me someone that can give that same connection and love to our daughter. No coincidence they are both named Bob. Happy Father’s Day to the two men that give my life such joy, to all the dads in my life, and all the dads everywhere! Here’s to you!